Industrial process control applications can be associated with some very stringent and challenging performance requirements for the physical equipment and components that are part of the process chain. In fluid based operations, control valves can be a point of significant impact from extreme fluid conditions, requiring careful design and selection consideration to assure proper performance and safety levels are maintained in a predictable way. 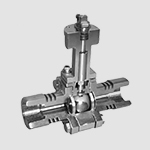 Industrial valves that are intended for application at the extremes are generally referred to as severe service or high performance valves. While there are plenty of published and accepted standards for industrial valves, one does not exist to precisely define a severe service valve. There are numerous manufacturers of severe service or high performance valves, each seeming to concentrate on a particular performance niche. Marwin Valve has their own entry in the class, a high performance ball valve intended for use with pressures up to 990 psi (69 bar) and temperatures approaching 1000 deg. F (538 deg. C). Specialty construction features for service in this range includes a 3-piece body, specialty alloys for body, stem, and ball, and graphite body seals and stem packing. Numerous options and variants are available to customize the valve build to suit a replacement or new installation. You can always get more information or discuss your special requirements with a product application specialist. They have application experience and access to technical resources that can help with selecting the right valve components to meet your severe service applications. Marwin Valve MS3000 Series High Performance Ball Valve from Hile Controls of Alabama, Inc.